Climbing and adventure has been an inherent part of Anna’s life since the age of 9 when her father first took her rock climbing on limestone bluffs in Red Wing, Minnesota. Originally from Wisconsin, the climbing seed was planted early and continued to grow. In 2012 she discovered a place called Indian Creek, Utah and a thing called van life and has been totally hooked every since. Anna has spent the past 8 austral summers working as an expedition outfitter and camp manager at remote field camps in Antarctica, based out of McMurdo Station where she is also a member of the Search and Rescue team. 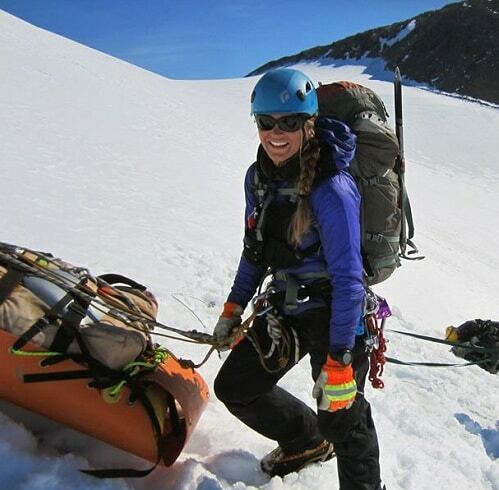 During her North American summers she has worked Trails in Denali National Park, Wilderness in Colorado’s San Juan Mountains and as a Rope Access Technician for industrial abseiling companies in Nevada and Hawaii. While she isn’t making coffee on the polar plateau or hanging off wind turbines in Nebraska or guiding in Washington, most of her free time is spent travelling to new and familiar places, going on long climbing road trips and visiting family and friends around the world. Numerous Alpine Rock routes in California, Colorado, Nevada, Utah, British Columbia, Washington, and Thailand as well as treks in the Himalaya of Nepal and the Andes of Peru.